ALRIGHT. Who remembers all the hype around Nisekoi? I sure did, in fact, I was one of the many people who thought that this Anime would be one of the best Animes to air during 2014. Today’s blog will be about both the first season and second season of Nisekoi. Nisekoi is either an average, or below average Anime. For me personally, The Anime series was average. Yes, I enjoyed the Anime, I liked watching it, but it didn’t feel like highlight to the Winter season. To provide some backstory. The story is all about this pendant, Rako was given 10 years ago. This pendant was given to him on a promise from his childhood friend, that they’d get married some day. However, he doesn’t remember who gave him the pendant, nor can he open it. Why can’t he open it? It’s because the pendant is locked by a key — something he doesn’t actually have. The key stayed with his childhood friend. From that point on you’re introduced to other side-stories that sort of overshadow the original story of finding who Rako made the promise with and who ultimately has the key to his pendant. These side stories make you forget that that main one. However, the more you watch, the more blurred the story gets as you feel like the Anime itself lost track of what was the original story. Each side story gets overshadowed by another, then another, then another; only to come back to the main storyline once again, towards the end of the Anime. This was apparent in both the first and second season. As this Anime is also labelled as a “Harem” the studio leaned heavily on it. As there are 4 girls, both main and supporting cast who all have a key, and who all think their key is the key to Rako’s pendant. All of which somehow, some way develop feelings for him too. Keep in mind that each of the 4 girls, also get their fair share of screen time as each character has their own dilemmas, which are their own subplots. The story is more primarily focused on Chitoge and Kosaki — I’ll tell you why. While Rako is dealing with all this other subplots, as well as finding out who has the key to his pendant. He also the sole heir to the Yakuza family, which is a Japanese “clan” if you will. How does that connect to either character? It connects to one person in particular, Chitoge. This is because, Chitoge is heir to the American Bee Hive Gang, and like all gangs whether fictional or non-fictional, any invasion from outsider clans on your own turf mean war. The only way for both heirs to the respective “clans” to stop a war between the two, is to, fake a relationship. Only slight problem though, they both dislike each other and cannot physically stand to be with each other. But fake it in order to prevent their clans from fighting each other. Obviously during the second season, you can see the two slowly develop a liking towards each other. But this “liking” isn’t really apparent in the first season. Now what about Kosaki? How is she used in the Anime? All good questions. She has been a friend of Rako since middle school. Better yet, she has a crush on Rako, and has since middle school. Likewise with Rako, who has also had a crush on her since middle school. But they’re both alike in regards to them not being able to convey their feelings towards one another because they don’t want to ruin the friendship they already have. During the first season, Kosaki didn’t know that Rako’s “relationship” with Chitoge was fake, but later on she learns about it and why they’re in a fake relationship. That right there is the second main story, to go with the first main story of finding out who holds the key to Rako’s pendant. Trying to balance a fake relationship, the woes of being the heir to a clan, high school life, and bottled up feelings for your friend you’ve known since middle school. Now that I’ve got the story (stories), out of the way. I thought I’d take the moment just to rant about the Anime. I enjoyed the Anime, like I said before, I even took it upon myself to read the Manga before the second season even aired. So when the second season was announced, I was excited. Like all people who read the manga to an Anime, you expect it to be as good, if not better. I was wrong. The first few episodes, were what I was expecting. They followed the manga, that part I really enjoyed. However, it did this one thing I disliked the most. The second season slowed down tremendously. Each episode in the Anime would only cover like 2 – 3 chapters, some times even less. It also felt like the second season of Nisekoi, focused less on the goal of finding who had the right key to Rako’s pendant and shifted most if not all its focus on the harem. As someone who has read the manga, and as someone who also really enjoyed it. Seeing the Anime focus heavily on the harem aspect instead of being more canon, really irked me the wrong way. It turned into something I was excited to watch, into something that I wasn’t all too excited for, further regressing to me not really enjoying the Anime as much anymore. I personally think that if the second season of Nisekoi followed more closely to the manga, then I think it would have probably been one of the best Anime of 2015. Granted, the year 2015 was an absolute crazy year for Anime with a lot of great and amazing shows airing that year. I still think that Nisekoi would have been up there if it focused less on the Harem and more on being canon. 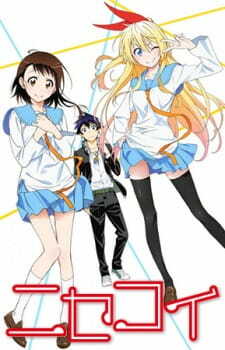 Nisekoi for me, is the Anime that had extremely high expectations, but failed to meet them. This Anime was, in my mind, an Anime that failed to capitalize on it’s potential to be something great. That is what bothers me most about this Anime, for sure. I think you mean “Raku” instead of “Ruko”. Otherwise, I agree with a lot of what you said. I remember starting Nisekoi when it first aired, but I ended up dropping it halfway through. I just didn’t find it to be as interesting as everyone else around me. It was very hyped and I never quite understood why. I did try to pick it up again last year or the year before that, but had the same problem of feeling very indifferent about it and more bored than anything else. It’s definitely not a show for me and something I’d probably also classify as average or slightly below average.